Though it was a sunny day, our minds drifted to the battleship before us having sailed through the fog of war. It is a humbling experience. We felt a certain reverence as we boarded the Battleship USS (BB-60) Alabama in Mobile, Alabama. Senior Travelers will relate since we grew up with stories about WWII from our parents. The Alabama played a role in helping take Japanese-held islands in the Pacific from 1943-1945. Called the “Heroine of the Pacific,” the USS Alabama led the American Fleet which sailed into Tokyo Bay on September 5, 1945. She received nine Battle Stars for meritorious service. You can read about battles involving the USS Alabama at: encyclopediaofalabama.org Among those battles are the “Great Marianas Turkey Shoot” as well as Okinawa, Luzon, the Gilbert Islands, and the Surigao Strait. The USS Alabama was a member of Admiral Halsey’s force, which fought in the battle off Cape Ehgano in 1944. In 1945, she dropped anchor in Tokyo Bay. HAVE YOU EVER BEEN ON A BATTLESHIP? Battleships are HUGE! After all, during the war, the ship had a crew of 2,500. The USS Alabama has 12 decks! For an admission fee of $15.00, you can climb inside the gun turrets, stand in the ship’s brig and imagine what it was like to fire the 12 mm guns. The Alabama is 680 feet long and 194 feet tall! We stayed at our battle stations for almost 72 hours, in which we were served bologna sandwiches and coffee once each day for three days. When we secured at dawn the third day, an announcement was made on the loudspeaker for everyone to be sure to go to breakfast before going to bed. Believe it or not, we were served steak and eggs, powdered of course, but they were delicious and we were very hungry. Some of the crew elected to go to bed instead of eating, and that left plenty for us that did eat. We had seconds. Be sure to visit the Aircraft Pavilion where historic airplanes are on display. There are 28 aircraft including an A-12 Black Bird spy plane and a Red-Tail P-51, which were flown by the Tuskegee Airmen. There is a flight simulator for your grandchildren! There are Memorials and Tanks throughout the park’s grounds. See a M26 Pershing Tank, a M48A1 Patton Tank, a T-55 Russian/Iraqi Tank from Desert Storm and a Vietnam PBR Gun Boat. There are other vessels on display besides the USS Alabama. 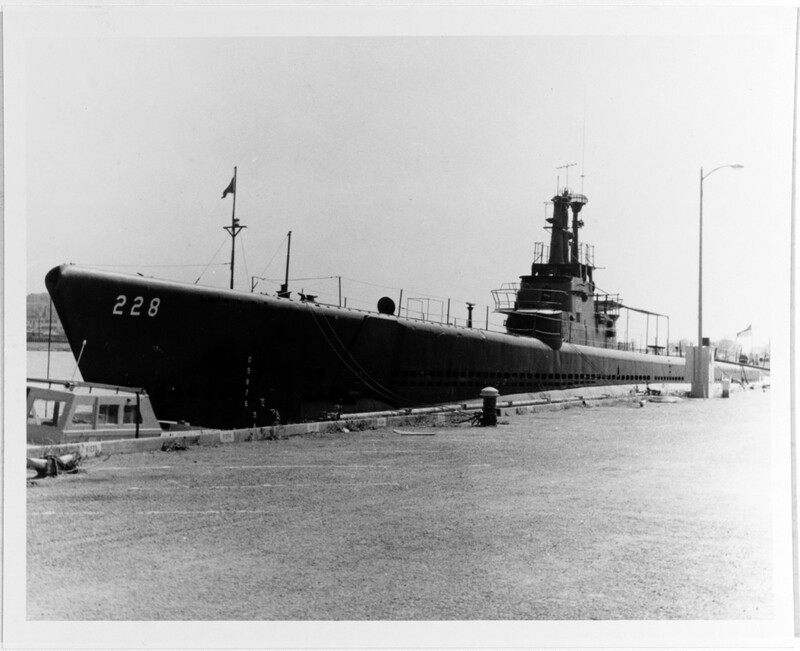 The USS DRUM (SS-228) is the oldest American submarine on public display anywhere in the world! The USS DRUM was commissioned in 1941 and arrived at Pearl Harbor in 1942. During her first engagement, she sank the seaplane Tender MIZUHO and three cargo ships off the coast of Japan. Summer Hours: April-September, 8a.m.-6 p.m.
Winter Hours: October-March, 8 a.m.-5 p.m.